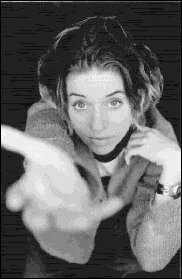 Ani DiFranco is a songwriter, vocalist and guitarist perpetually on the move. From the raw "folk punk" of her early albums through the jazz/funk grooves she created during her years touring with a five-piece band to the twists and turns of her current work as a solo artist, Ani's restless creativity continually leads her and her listeners into ever more exciting territory. Born in Buffalo, New York, DiFranco was already singing and playing guitar in public before she was old enough to drive. As a teenager, the poems she'd been writing in "long skinny columns" soon evolved into lyrics, and music became a way for the teenager to talk about the things that mattered most to her: the power dynamics of romantic entanglements, the fragmentation of her family, the choices she watched her friends making, and the state of life in her hometown and her country. The early 1990s brought a temporary relocation to New York and classes in poetry and politics at the New School, but her real education came on weekends, as she hit the road with increasing frequency and growing confidence, developing her signature percussive finger picking and dynamic range in order to grab and hold the attention of noisy bar crowds. Even the need to fill time while re-tuning became an opportunity to improvise off-the-cuff stories about whatever had happened during the course of her day, which became yet another hallmark of her style. After just about every one of her funny, outspoken, intimate gigs, she'd leave behind a fresh batch of converts eager to spread the word to everyone they knew, via cassettes at first and then CDs. Rather than waiting for some A&R bigwig to sign her, Ani simply created her own record label, Righteous Babe, eventually turning down legions of potential deals when she realized they had nothing to offer that she couldn't provide herself. In the process, the born performer began to learn her way around the recording studio, too, gradually developing her own innovative means to convey the spontaneity, intensity and wit of her live concerts on disc. Nearly a decade and a half of hard work, glowing word of mouth, and relentless touring later, the self-described "Little Folksinger" is packing joints like Carnegie Hall and amphitheaters around the world, though she still makes each venue she plays feel as cozy as a living room and as sweaty as a neighborhood dive. That DIY label of hers, still based in Buffalo (with a European branch based in London), has now released 16 of Ani's own CDs and about a dozen more by an eclectic hand-picked roster of artists whose music is as unclassifiable and unpredictable as hers. But that's only part of the story. Over the years, Ani has swapped album appearances with Prince and Maceo Parker, produced recordings by Dan Bern and Janis Ian, performed orchestral versions of her compositions with the Buffalo Philharmonic, helped find wholly new fans for the songs of Woody Guthrie and the stories of Utah Phillips, had her own tunes covered by the likes of Dave Matthews, and Chuck D, recorded duets with both John Gorka and Jackie Chan, and inspired countless other musicians to rewrite the rules of the recording industry by striving for self-sufficiency and refusing to allow art to be subsumed by cold commerce. Through her Righteous Babe Foundation, she's been able to support grassroots cultural and political organizations around the country, and she has repeatedly lent her time and her voice to such diverse pursuits as opposing the death penalty, upholding women's reproductive rights, promoting queer visibility, and preserving historic buildings back in Buffalo (including a long-neglected church currently being transformed into the new headquarters of Righteous Babe). Ani DiFranco's career has been full of surprises — for her, and for the rest of us — and she's no stranger to change, both sudden and slow. But some things remain unchanged, like her commitment to speaking the truth, as she sees it, without fear or concession. Bruce Cockburn recently observed in Performing Songwriter that Ani considers it part of her job description "to try and reflect real life in [her] songs. The life of the streets; the life of nations; the lives of people coping with power or its absence, looking for joy through the loneliness and pain and the complexities of relationship; the life of the spirit. All these are the stuff of human experience, and human experience is what we all share." She does so with two basic instruments, both of which are also constants in her ever-evolving world: her trusty guitar and her unforgettable voice. Vanity Fair describes the latter as "astonishing... coolly, permanently urgent, tugging at the sleeve or close at the ear, like the murmur of a lover who knows every last secret and decides to stay." Sounds like just another Alanis Morrisette or Sara McLachlan clone to me, but then not much in the music world after 1980 is decent in my opinion, but it's not bad for the latte and cappucino set. Actually she's been around way longer than both of them, and they sound nothing alike. I would say listen to her sometime but I think your head would explode. I did listen before I wrote my comments, but like most modern music, it sounds to me like she is simply mad at the world, therefore the Morrisette comparison. I admitted up front that I think that most of the music mass marketed in the last 10 years or so is junk, but then listening to The Beatles live was not good for the ears either. You want a woman (or a pair of women) who took on the establishment and beat the man at his own game? Try listening to Heart and all of their incarnations over the last 25 or 30 years. Please, please, please, please...don't ever compare a lyrical genius like Ani to HEART! lol. What is the world coming to? As for the "mad at the world" comment, I think she very well might be a little perturbed by the state of affairs on our dear old mother earth. Aren't you? I know I am. And you said you listened to her, but I can only assume you might have been able to listen to a handful of songs at most. You can't judge an artist by listening to a few songs, and reading a few reviews. Sorry Mike, but Ani's my girl...and as you will find-Ani D. fans are die hard about her. I only listened to a few songs, but it was enough for me to figure out her style didn't suit my musical taste. You notice I didn't include her political statements. What she does politically is her business, even if I don't agree with it all. If what she does makes your day, go for it! That's OK though. What a boring place the world would be if everybody agreed about everything! Great piece, Ann. Well written. Do more like it. DiFranco did it all on her own, no big record contracts and no slick promoters and has since gone on to make several others' successes as well.